The Miami Hotel stands dilapidated but proud in the midst of the feverish construction of hotels, condos, and office towers along lower Sukhumvit Road. 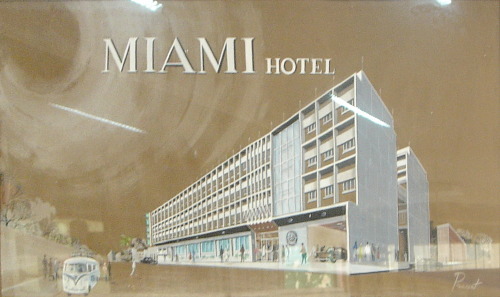 This depicts the original plan of the hotel after its construction. An extension of the outer wing along Soi 13 was built at a later date. For years the hotel overlooked the infamous Thermae Coffee Shop which was destroyed in 1996 and is now a vacant lot used for the storage of vendors stalls. It boasts its own sixties style coffee shop and a pool.